Do you remember learning to ride a bike? You might find it surprising that there are elements of learning to ride a two wheeler that can be applied in godly parenting. Here are a few suggestions for effectively training your child in bike riding and in righteousness. Familiarize your child with the names of the various parts of the bike and how they operate. This is also important in the spiritual process. It is valuable for a young person to learn the various books of the Bible and how God’s commands and promises operate before they can fully benefit from them. Be patient, remembering that learning to ride a bike is a process. Parents should also be patient in teaching their children to obey biblical principles. It is much more important, for long term success, to learn each discipline thoroughly before moving on to the next. Demonstrate how to ride a bike. Practical demonstration is much more effective than merely reading instructions from a manual or telling a child how to ride a bike. Although reading God’s Word and communicating its principals to a young person are beneficial, it’s the application of that truth, as demonstrated in your lifestyle, that is most effective. Protect your son or daughter while they are learning to balance themselves. 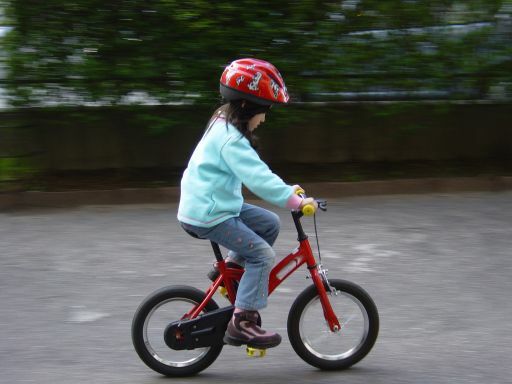 It is beneficial for a parent to run along side a youngster who is learning to ride a bicycle. This enables the one who is learning to ride to practice balancing while the parent assists him in avoiding calamity. Similarly, a parent should consistently walk along side a child on his spiritual journey. This gives him opportunity to practice personal application of God’s Word while the parent assists in recognizing and avoiding potential pitfalls. Prepare your novice rider to solo. Although bicycles built for two exist, the majority of bicycles are made for a single rider. It’s extremely important for parents to train their children to ride their bikes with the knowledge and understanding they will need to one day ride alone. Parents cannot always be with their children. Therefore, parents should consistently develop their children’s spiritual maturity in preparation for them to live independently. Encourage your young person to stay the course. No child learning to ride a bike does so perfectly. That’s why they call it “learning”. In the same way valuable lessons are learned from the mishaps of training to ride a bike, he will also learn from errors made on the road to spiritual maturity. In both cases, help your child to learn from each experience and encourage him to persevere. Just as you can train a child in the skills necessary to enjoy the temporal pleasures of bike riding, parents can train their children in the principles necessary for an eternal relationship with the Lord Jesus.